Madelyn Linda Zelman is a founding member of Debbie’s Dream Foundation. She is the Secretary of the DDF Board of Directors, Communications Editor, and has served as DDF Acquisitions Chair. Madelyn received her Bachelor of Arts degree from Brooklyn College. She taught English in middle school in Brooklyn, New York for four years and taught night adult education classes in English as a Second Language. During that time she also pursued her Master of Arts degree in Speech and Hearing Therapy at Brooklyn College. After she moved to Florida, she obtained her Master of Education degree from Florida Atlantic University. Madelyn was an adjunct professor of English, speech communication, and accent reduction at Broward Community College for fifteen years. In addition, she had her own business tutoring students in English, study skills, and verbal SAT preparation. Madelyn has been a longtime member of the Society for Preservation of English Language and Literature (SPELL) and is a frequent contributor to the SPELL Binder newsletter. Her devotion to correct English language usage has been recognized in commendation letters from media luminaries, including Oprah Winfrey and Joan Lunden. She has been the subject of numerous articles about her role as the Grammar Lady or the Grammar Guru in the Fort Lauderdale Sun Sentinel and the Miami Herald. She was featured on Channel 7 News and was a frequent guest on local talk radio shows. Madelyn is an involved member and/or supporter of several organizations focused on national security including The United West, Citizens for National Security, the Investigative Project on Terrorism, David Horowitz Freedom Center, Center for Security Policy, and Americans Against Hate. She lectures to community organizations on the importance of this issue. Madelyn is on the Nova Southeastern University (NSU) Ambassadors Board. 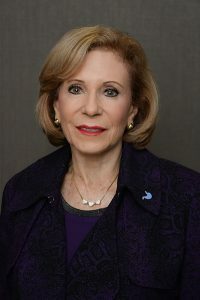 She serves on the Crohn’s and Colitis Foundation of America (CCFA) Book of Hope luncheon committee and is Chair of the CCFA Ad Journal Editing Committee. Madelyn lives in Plantation, Florida with her devoted husband, Danny. She is the proud mother of three daughters and dotes on her five grandchildren. Madelyn can be reached at Programmar@comcast.net.